Recently, I had some transition in my home life and have two spare rooms to rent out. I decided that I wanted to rent out the rooms as furnished. Just made more sense to me, given my lifestyle. First I went about cleaning the two rooms from top to bottom. I used some lovely nontoxic cleaners (Mrs. Myers Countertop spray and Murphy’s oil soap) that made the place smell lovely. Then I went to TJ Maxx, Marshall’s and Ocean State Job Lot and found some real deals. But I was careful and made sure that things not only looked nice and were somewhat gender neutral but also they were necessary. Believe it or not I found a dresser on the side of the road in mint condition and very clean. I felt like the Universe was working with me. I provided everything: sheets, bedding, towels, lamps, office supplies, and hangers for the closet in addition to the furniture. But I decided to decorate very simply. I chose gold and gray for the bedroom and grey, white and black for the office/TV room. I wanted to provide all the amenities that people need to live a comfortable life but I did not want the space to be cluttered. I slowly added things in, and then sometimes subtracted things. Finally I finished. The place looked serene and accommodating. I wanted to book the place myself and spend a night in the calm, clutter free setting. Besides patting myself on the back, I really share this story to explain that clutter free living and simply decorated rooms really lead to a calm feeling. Studies show that the brain can only focus on so much at once. So even if you have truly beautiful things in your home, if you have too many of these things, they cancel each other out. The human eye will not be able to rest on and take in the beauty of any one thing if there are so many other things competing for one’s attention. So in this case, less really is more. So what do you do with all your beloved tchotchkes? I have helped several clients with this issue over the years. The solution is to put some of them away. How to decide? Well, you could follow my rule of thumb and use a Seasonal approach. Here in New England we have about 5 seasons: Winter, Spring, Summer, Fall and Holiday. Put out what seems appropriate for that season. Then box up the rest in a clear plastic bin with a label indicating what’s inside. In that way, you and your guests can enjoy optimal serenity and beauty in your home. 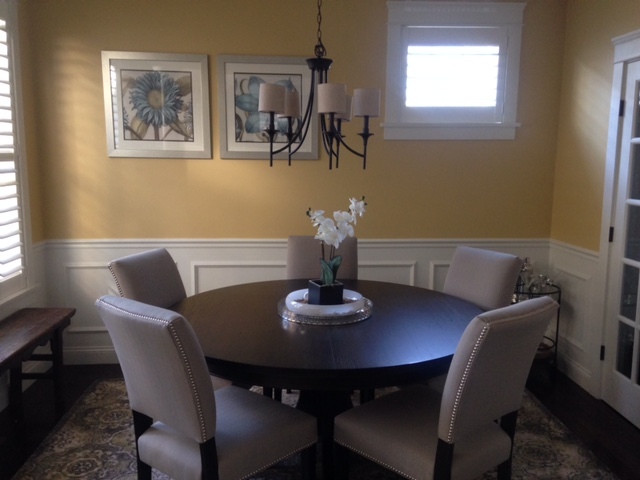 I have included an image of a dining room from one of my clients. He kept his home clutter free and simply decorated and it was so wonderful to visit.